Eleven years after the release of the Oscar-winning climate change documentary An Inconvenient Truth, former Vice President Al Gore returned with An Inconvenient Sequel: Truth to Power. The follow-up film focuses less on the informational slide show style of the original and more on a call to action. An Inconvenient Sequel follows Gore from Greenland to Miami to India to Paris as he speaks with people on the front lines of climate change impacts and hosts citizen climate leader trainings. Much of the film deals with the historic Paris climate agreement. However, Gore recognizes the challenges this and other climate initiatives have under the climate-unfriendly leadership of President Trump. The documentary ends with a call to action, particularly local action, and encourages viewers to get involved in their towns, schools, workplaces, and communities. On July 28th, YPCCC hosted a premiere screening of An Inconvenient Sequel, attended by approximately 550 people, including Connecticut Congresswoman Elizabeth Esty, who participated in a post-movie question-and-answer session. Congresswoman Esty described the current policy landscape in Congress and Connecticut and asked the crowd to get involved. Esty and YPCCC Director Anthony Leiserowitz also discussed the results from a brief audience survey taken at the screening, particularly a question gauging interest in participating in a campaign to address climate change. In the survey, which was conducted before and after the film, viewers were asked about their climate change beliefs and attitudes and whether they thought campaigns on climate change can influence government and corporate action. 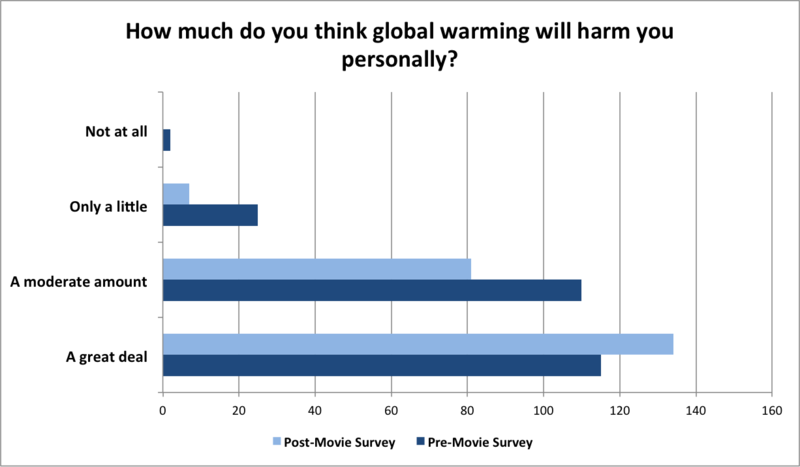 In YPCCC’s most recent Politics and Global Warming report, 55% of registered voters said they were very or somewhat worried about global warming, compared to 98% (pre-movie survey) and 99% (post-movie survey) of An Inconvenient Sequel screening attendees. The preliminary survey results indicate that the film inspired this already highly engaged audience to get more involved, including making them more willing to join a campaign to convince elected officials to act on climate change. This suggests that messages encouraging action and demonstrating progress may make people more hopeful, engaged, and willing to act on climate change. This theme, of individuals participating in the fight against climate change, runs throughout An Inconvenient Sequel. While Gore is the most prominent figure in the documentary, he meets with other engaged citizens around the world. The 50 participants in Gore’s first climate leadership training, the young survivor of the Haiyan Typhoon in Tacloban City in the Phillipines, the CEO of Solar City, the conservative mayor of Georgetown, Texas, working for a 100% renewable city – all are working for climate progress in their own communities and demonstrate that local action can make a difference.